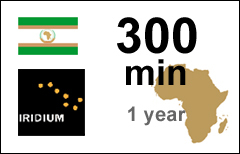 The Africa 300-min voucher refills your existing Iridium Africa account with Sattrans. Calls to fixed/cellular phones: $1.00/min. Calls to Iridium phones: $0.75/min. Direct Internet Data & AxcessPoint: $1.00/min. Maximum Account Validity. The maximum validity of Iridium Africa accounts cannot exceed 1 year from the date of the most recent voucher reload. Maximum Age Limit. The Maximum Age Limit of the minutes in the Africa plan is 3 years.